Sprinkler Juice: Why Paint Tree Trunks White? Why Paint Tree Trunks White? 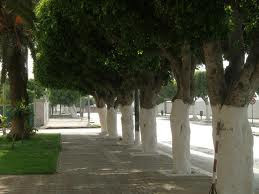 It is not uncommon to see a line of trees that have had their trunks painted white. What is common, however, is not understanding why someone would do this. There are many reasons why a person might feel compelled to paint his or her tree white. Some do it simply for decoration, others might paint a tree white so that drivers will notice it better when they are driving in dim or dark settings. But there are 2 common reasons experienced landscapers and gardeners paint tree trunks white. Oh pardon me, but Mr. Three, why Paint the Tree Trunks White? One of the most accurate and easy-to-understand answers I have found on why people paint tree trunks white came from Yahoo! Answers and was actually chosen as Best Answer. "It is done to young trees that have not developed their mature bark or that will not develop a thick enough bark. In cold sunny climates it is to reflect winter sun off the thin bark, not allowing it to warm up and then suddenly freeze when the sun sets. . . In scorching hot climates the white paint reflects the heat off the trunk. It is seen most often with citrus trees which never develop a thick bark for protection from the sun." You see, the outer bark is composed of non-living cells and as the tree grows this bark cracks and is shed by the tree. If the cracks are deep and go all the way to the wood of the tree then you've got a problem. Such cracks are normally caused by freeze or cold damage. Painting the trunks of the trees with white paint tends to reduce the amount of this type of damage. Damage takes place when the cells in the living tissue beneath the bark break dormancy on warm, sunny days and then rupture and die when night temperatures drop below freezing. The tree is injured when enough cells in a given area are killed. The following spring these dead areas will appear discolored and sunken. In time the bark killed by sun-scald will split and peel. These areas also provide entry points for insects and diseases. To give trees growing in a row a "park-like" appearance. To keep rabbits from stripping the bark off young trees. To protect trunks if a larger tree is removed and no longer provides shade. To protect the bark of the tree from infestation by borer insects. To protect exposed limb stumps after cutting. To help repel adult beetles and weevils, especially on young trees. This is a very informative video from Ed Laivo of Dave Wilson Nursery that explains and demonstrates how painting a trees exposed trunk can help prevent sunburn damage to the tree. Sunburn damage to a tree can make it easier for bores to penetrate the trunk, causing more damage.